Skype is now offering unlimited world wide calls worth $14 free for an entire month from your Skype account, which means in addition to making free Skype to Skype calls, you can also call offline contacts on their mobiles and land-lines. The free Offer is available only to existing Skype users who have been registered with Skype more than 29 days. Only one free Unlimited World subscription can be claimed per customer, the offer is not available in China, Korea, Russia or Taiwan. The free offer must be redeemed by 15/11/2012 and to qualify for the offer, you must provide valid payment details. After the first month, your subscription will automatically continue and payments will be taken monthly unless you cancel within 27 days of the start date. One month of free unlimited¹ calls, worth €10.49. Calls to mobiles in seven countries, including the USA, Canada and Hong Kong. Unlimited calls to land-lines in over 40 countries. Call when you want, day and night, seven days a week. No obligation — try it for a month and cancel at any time. 1.Free Calls are accepted to mobiles and land-lines in these countries: Canada, Guam, Hong Kong S.A.R. China, Puerto Rico, Singapore, Thailand and United States. 2.Free Calls are accepted to land-lines in these countries: Argentina, Australia, Austria, Belgium, Chile, Croatia, Czech Republic, Denmark, Estonia, Finland, France, Germany, Greece, Hungary, Ireland, Israel, Italy, Japan, South Korea, Luxembourg, Malaysia, Netherlands, New Zealand, Norway, Poland, Portugal, Russia (Moscow and St. Petersburg only), Slovakia, Spain, Sweden, Switzerland, Taiwan, United Kingdom and Venezuela. To grab unlimited Skype worldwide 1 month free subscription , first sign-in to your skype account and visit this promo page , then click on “Claim your free month” button and select the payment method. 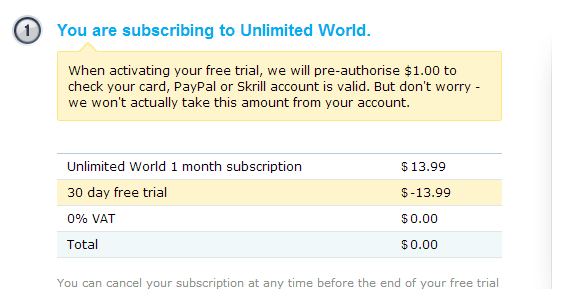 When activiating the free offer,Skype will pre-authorise $1.00 to check your card,Paypal or skrill account is valid.But don’t worry, they won’t actually take this amount from your account.